I'm not talking about any romance of my own, more's the pity. 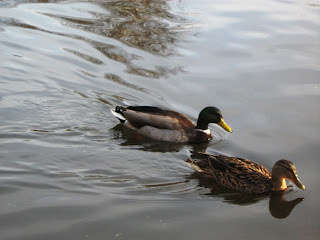 I'm talking about the apparently vast population of ducks, swans and other birds living in Dublin's city parks. Yesterday, from my apartment window, I watched two boy pigeons having a big fight over a girl pigeon, who was doing her best to look as though she didn't noticed. And today - ah - it was so beautiful I spent a couple hours in Stephen's Green feeling all spring-like and optimistic. Romance was totally in the air too, and not just among the couples making under the chestnut trees. I guess this is the time of year when all the Irish ducks and swans start thinking about...well, the birds and the bees. 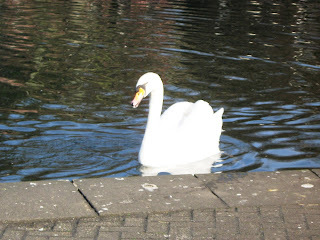 My guess is, he probably treated some lady swan really badly a while ago and then, when he wanted her back, she just told him to stick his head where the sun don't shine -- and she didn't mean the bottom of the lake in Stephen's Green!!! On the way back to college, something funny happened; I bumped into the lady who treated me to lunch in Roly's Bistro a few weeks ago. I was a bit embarrassed, becase I felt I hadn't thanked her enough for being so nice, but she actually invited me to meet up with her for a glass of wine one evening next week. I have to choose the place, so I'll have to, ahem, research a good place for a glass of wine and maybe a little snack or something. She also told me that there's going to be a big, huge ceili in the park on St Patrick's Day, which sounds like a load of fun. I've seen Irish dancing before, of course, but this would be like a huge, mass event with THOUSANDS of people and HUNDREDS of musicians and well, wow, basically a gruelling mass of arms and legs all moving to the beat. Ha. Take that, Rio de Janeiro! I expect there'll be more clothes involved. Although, you never know. My greengrocer told me that St Patrick's is the day when Irish people are EXEMPTED from whatever vows they've taken for Lent. Apparently, a lot of people still give up stuff -- chocolate, smoking, booze, or whatever - but when St Patrick's Day comes, it doesn't count. How cool is that? He said the Missis is putting him on a diet for Lent, but "I'll eat so much on Paddy's Day I'll more than make up for it." I've been given the chance by Dublin Tourism to go to a sports championship in Croke Park. Gaelic games are exciting, for sure. But I don't want to miss the ceili, either. Spoiled for choice, I guess. If you're looking for a nice place for wine and a snack go to Ely wine bar just behind St. Stephens Green, http://www.elywinebar.ie/ but book or go early. Gosh, that looks pretty fancy for me! I'm looking at the website now. It looks gorgeous but maybe out of my budget... maybe if I save really hard.